DG Nteranya Sanginga was recently in Tanzania where he attended the third meeting of the Independent Steering Committee (ISC) of the CGIAR Research Program on Roots, Tubers, and Bananas (RTB) and held meetings with the Belgian Ambassador and the Institute’s staff and youth Agripreneurs at the hub. DG and Lawrence Kaptoge discussing the progress of construction during the visit. The aim of the ISC meeting held in Dar es Salaam, 6-8 September, was to review the program’s progress and provide feedback on the new phase and flagship projects. As is his tradition, Sanginga took the opportunity to meet all the staff at the hub as well as the Tanzania Youth Agripreneurs (TYA). While meeting the staff, Sanginga updated them on developments at the Institute including the current financial status. He said IITA along with other CGIAR centers was facing a cut in funding and therefore it was important for staff to put more effort into resource mobilization, exploring alternative sources of funding for activities as well as utilizing the available resources wisely. 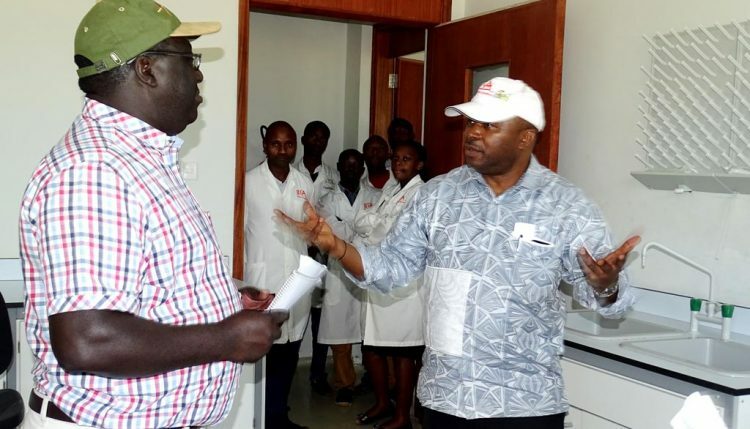 Sanginga further said he was pleased with the efforts by the administration in maintaining the research facilities including the Science Building, which was inaugurated in 2013. 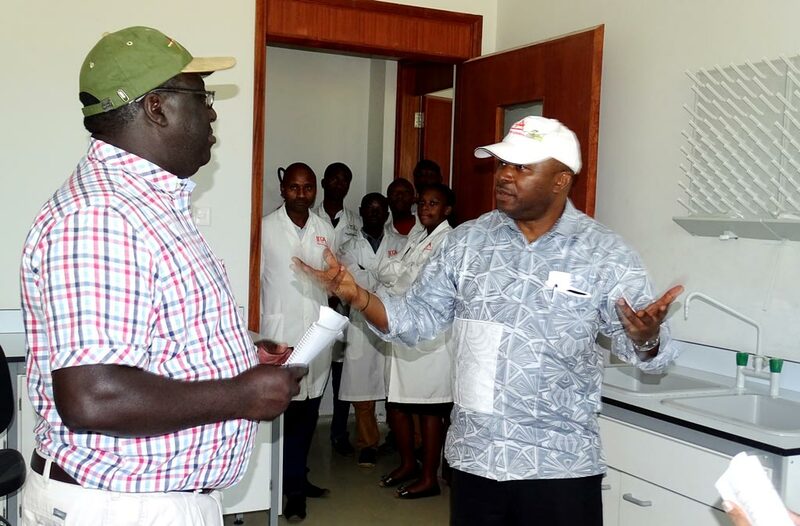 Sanginga spent time with the TYA team at their center of excellence at Kwembe, 40 km from Dar es Salaam, where he toured the various agro-enterprises carried out by the youth and assessed their progress. These include cassava processing and production, poultry, rabbit keeping, and fish farming. 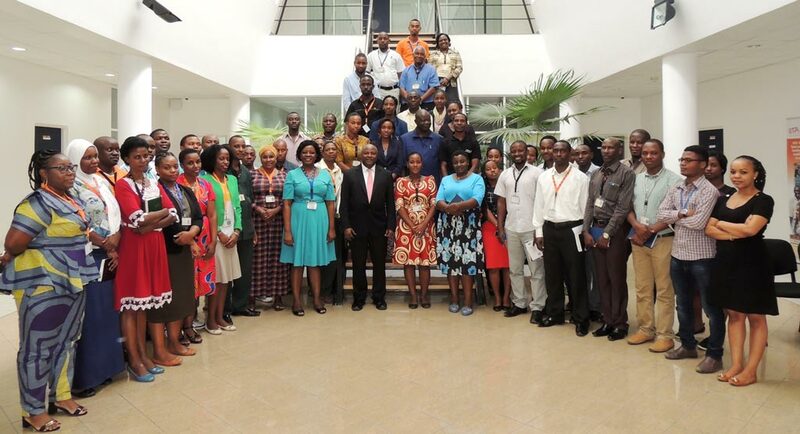 The DG and IITA staff at the East Africa hub office in Dar es Salaam, Tanzania. While he acknowledged their efforts and promised more support from the Institute, he also challenged them to work extra hard to expand their businesses and transform them into profitable enterprises to attract more youth into agriculture. Sanginga also visited the Belgian Embassy and discussed with the ambassador on how to strengthen collaboration with the Institute.